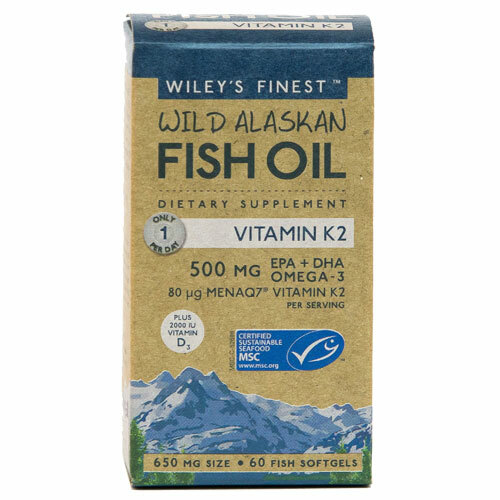 Wiley`s Finest unique small softgel combines MenaQ7® Vitamin K2 and Vitamin D3, with EPA & DHA Omega-3s from Wild Alaskan Fish Oil. Together these nutrients support optimal bone and heart health by helping to incorporate Calcium into bones. The non-GMO chickpea sourced MenaQ7® is an easier way to get K2 than traditional dietary sources, such as fermented soy (natto). Concentrated Fish Oil Omega-3 Ethyl Esters, Fish Gelatin, Glycerin, Purified Water, Vitamin K2 (MenaQ7) in sunflower oil, Vitamin D3 in medium chain triglycerides, Non-GMO mixed Tocopherols (Natural Vitamin E). Contains fish: Alaska Pollock (Theragra chalcogramma). As a food supplement, take 1 capsule daily with food. Effective when taken alone or as a complement to your calcium & magnesium supplement. Do not use this product if safety seal is broken. Consult your physician before using this product if you are pregnant, nursing, using blood thinners or anticipating surgery. Below are reviews of Wiley`s Finest Wild Alaskan Fish Oil Vitamin K2 - 60 Capsules by bodykind customers. If you have tried this product we'd love to hear what you think so please leave a review. 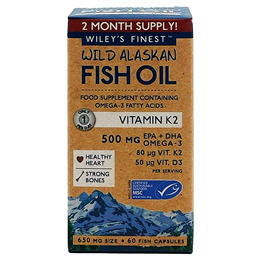 Vitamin K2 Wiley`s Finest unique small softgel combines MenaQ7® Vitamin K2 and Vitamin D3, with EPA & DHA Omega-3s from Wild Alaskan Fish Oil.